This past Sunday was a very special day for those of us in our World War II reenacting organization. We played host to 101st Airborne veteran Elijah Whytsell and members of his family at the MAPS Air Museum to honor Mr. Whytsell’s service and present him with a token of our gratitude; a certificate of thanks and a reproduction WWII paratrooper jump jacket featuring his awards and honors, as well as his rank of Technical Corporal. Elijah also got the opportunity to go on board the museum’s C-47 troop transport. The last time he saw the inside of this type of aircraft, he was jumping out of it over Holland in 1944 during Operation Market Garden. A tour of the rest of the museum and lunch followed. As an area resident on the roster of 101st Airborne veterans from World War II, members of our organization’s Veterans Affairs Committee (including Derrick Kulscar, Jared Shiele, and Victor Cabrera) reached out to Elijah and his family last year in order to see if they could be of assistance in any way. Fast friendships ensued and Elijah was eager to share stories from his life and his time in the service. 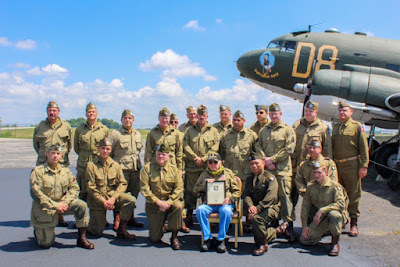 Elijah Whytsell had been part of Easy Company, 506th PIR, 101st Airborne Division which has now been made famous in the book and HBO mini-series “Band of Brothers”. Elijah’s stories and observations of the various officers and men were amazingly recognizable to anyone who is familiar with “Band of Brothers”, and his experiences before and after the war paints a picture of an individual who has lived a full life. His two siblings also served during the war and brother Victor (who had been in the Navy aboard the USS Wright in the South Pacific) was on hand yesterday for the ceremony. Thanks go out to our own Derrick Kulscar for putting this event together and Mark Gaynor for getting the paratrooper jacket produced. Thanks to our members and the members of the 82nd Airborne, 90th Infantry Division, and 4th Infantry Division reenactor units who helped put together the funding for the jacket. Thank you to all of the members of our unit who participated as well as Lt. Brooks from the 325th GIR of the 82nd Airborne. Last but not least, thank you to Kim Kovesci and the MAPS Air Museum for having us at their amazing facility. Thanks go out to our own Derrick Kulscar for putting this event together and Mark Gaynor for getting the paratrooper jacket produced. Thanks to our members and the members of the 82nd Airborne, 90th Infantry Division, and 4th Infantry Division reenactor units who helped put together the funding for the jacket. Thank you to all of the members of our unit who participated as well as Lt. Brooks from the 325th GIR of the 82nd Airborne who participated yesterday. Last but not least, thank you to Kim Kovesci and the MAPS Air Museum for having us at their amazing facility. REENACTORS! 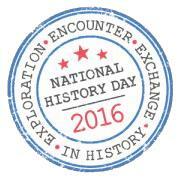 The Cleveland History Center of the Western Reserve Historical Society needs judges for the 2016 National History Day Contest! Returning? Interested? Don't wait! Register now. If you have judged for History Day in past years, we needn't explain the value of this annual event in getting intermediate and secondary students connected to the study of history. Newcomers to the judging process will find it to be a rewarding opportunity to witness first-hand the impressive work being done in the area's public, private, and parochial schools. Volunteering as a History Day judge will entail your presence at the Region 3 contest on Saturday, March 5th. Following a brief orientation, judging teams of three members each will disperse to evaluate student papers, websites, performances, documentaries, and exhibits at various sites in the Cleveland History Center of the Western Reserve Historical Society or on the campus of Case Western Reserve University. During or following a lunch provided by Cleveland History Center, judges will complete their evaluation forms and confer with other teams in their category to select the finalists for the state competition. Judges are invited, though not required, to attend the afternoon awards program. Every year National History Day sponsors an educational scholarship contest for young people, middle and high school students (6th through 12th grade). It is a non-profit educational organization that offers academic programs around the world annually for students conducting original research on historical topics of interest. District winners go on to compete at the State level and national winners receive a full-ride scholarship to Case Western Reserve University. Saturday March 28th, members of Baker Co., 502nd 101st ABN, myself included, volunteered as judges for the District 3 National History Day Competition at Western Reserve Historical Society in Cleveland, Ohio. One of the goals was to provide young people with a high quality educational experience regardless of the outcome of the competition. The time spent, a helpful, positive interaction with the students, is an integral part of their learning process. Baker Co. participated in judging 3 of the 5 categories. Exhibits - Senior Class: 1Lt. Victor Cabrera, Junior Class: SSgt. Chris Bauer, Written Paper Themes: Pvt. Jared Schiele, and Web Sites – Senior Class, 2Lt. Chris Smith. The other 2, Documentaries and Performances were done at a separate location at CWRU’s Nord Atrium. It was interesting to see many young bright students that are passionate about learning with regard to people in history whether it be national or world renowned. On this year’s theme "Leadership and Legacy in History", they learn to develop perspective and understanding rather than just bare facts and dates. It is a vital part in educating these young minds on examples of true leadership as they pave their way into society. Just to mention a few of the choices of the persons of interest was "The Legendary Cartoons of Thomas Nast" a very influential figure and cartoonist for Harper's Weekly during the American Civil War. The truly altruistic legacy of Sir Nicholas Winton, the silent savior who rescued 669 Jewish refugee children in Czechoslovakia from Nazi Germany during the eve of WWII. And of course George Washington, the determined patriot of the US revolution. With several schools competing, the program was divided among many judges who come from different backgrounds within our community. School teachers, doctors, lawyers, and prominent businessmen as well as politicians. Evaluations for the Exhibits, Paper and Website interviews for both senior and juniors were done between 9:15 am to 12:15 pm. Lunch was served then turning in of judging results around noon till 2 pm. Any ties or close results were given run-offs to determine the top 3 winners. Public viewing of the exhibits followed right after the winners were released to the public. As my second year of volunteering as a judge, it was just as fun as the first. It certainly was a great and rewarding experience. To see such young minds delve into great ideas with people that have influenced our time is very intriguing. It makes you feel proud to have a next generation of citizens who are conscientious about our future by learning about our past and the people that shaped it. Not only did the students gain knowledge and understanding but the judges did as well by interacting with the students about different types of leadership and the legacy in history. To our efforts, another successful event we celebrate as we were able to set out what we intended to do. To quote our Task Force Commander Capt. Guditus "Let me first thank you all for the outstanding professionalism, attitude, esprit de corps and combat effectiveness you displayed while assigned to Task Force Guditus. Your unit set the benchmark for the others in the Task Force to follow." Day One, travel was kicked off with 7 different origin to destination Operation Norwind at FIG was accomplished smoothly with fine weather. Upon arrival of most members, proper setting of residency at the assigned barracks was established following registration and turning in of Ammo. The evening went with the welcoming of new members along with the usual social gathering and capped with staff and members meeting to prepare for the 2 day battle. Day Two, the event started with continental breakfast as usual with bagels & muffins. Proper protocol of weapons and equipment inspection done by the Allied command was impressed with our standard. Convoy to the battlefield did not commence till late of the day as temperature steadily climb to manageable levels of playing time. It wasn't long till we identified who we can count on as a team player to our Task Force that was merged with other Special Operations forces that included US & Canadians ABN along with Ranger Units. Regardless of some of the misfortunes in the group the 101st ABN 502nd PIR along with the 506th HHC were able to spearhead most of the battle aggressively, to capture and hold our objective "The Bridge" many times over of which our SSG Bauer proudly resonated to name it after us. The Germans counter attacked to reclaim the bridge to no avail as their futile effort of onslaught was reduced to cinders once the smoke cleared. Post battle weapon cleaning instruction for the new recruits at the barracks was conducted with our 1st Sqd. Sgt. Cessna. Dinner was served with the local Pizzaria delivery and few toast while in the hands of poker and craps. Day Three. After a remarkable performance by our Airborne units 502nd was again in the lead to attack to face the front line and stop the German advance that started out as a stalemate. After a few tactical input adjustments from our staff, we were able to push the Germans back and take the hill under heavy machine gun fire that allowed the a coordinated efforts of the 3rd ID's flanking maneuver and the 4th Armor decimating the enemies half trucks and armored personal. As a result German high command was forced to concede their territory to us under the flag of ceasefire to allow them to regroup and claim their dead and wounded. The day was ended with an almost impossible task of advancing through high grounds, rough terrain and knee high snow covered woodlands. But through our gallant efforts and determination, led by our 2nd Sqd. Sgt. Gaynor we were able to outwit the German forces by having a two-prong attack that kept the Germans at bay allowing the rest of the Allied forces to capture the German Command Post. Our success and great efforts would not have been possible have we not sustain ourselves with the proper training, leadership chain of command and the individual physical fitness gained for this event. Because of the snow covered terrain brought about by the weather, navigation and communication proved to be a challenged. Again I need not magnify the importance of training well on map reading, land navigation and communication (both HQ & Platoon level) while under the duress of battle. Thanks to XO Lt. Smith for his skill in RTO communication in keeping the Command and Control intact. It would have a different result had we not had his talents. Kudos as well to our brevetted leadership role by Sgt. Cessna and Cpl. Kulksar. There are other good Allied Units out there besides us but we cannot always assume that all can and be relied upon to cover our flanks. Therefore we must be vigilant in our efforts to continue prodding our goal. Elicit a reaction and learn from it to set an example. I need not proclaim in detail the difference a sound unit with proper discipline amongst the ranks as you saw the comparison to some axis and allied both. Their shortcomings is the reflection of command leadership. From what you have seen and a part of, on behalf of our staff, we hope that we have encourage you enough with fervor motives to join us once again to our next training days to follow this April. We will be joined by other visiting units as guests. Your continued support in this exciting event will show force and clear indication of who and what is the 502nd is all about. Don't miss it! Till next meeting gentlemen and God speed!